A few months ago, I had the following conversation with my husband's cousin. 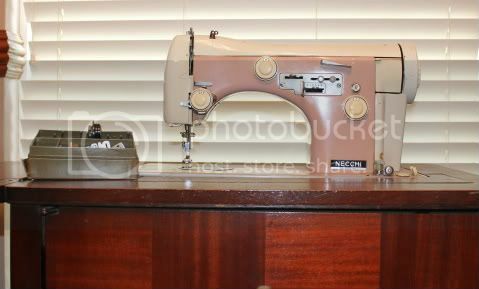 Cousin: Do you want Grandma's sewing machine? She asked all the girls and no one wanted it. Cousin: I don't know. Not a Singer. It starts with an N.
Me: OH MY GOD IS IT A NECCHI? Cousin: I guess you want it? Be still, my heart - it's a pink Necchi Supernova Ultra Mark Two. With the original cams and everything. 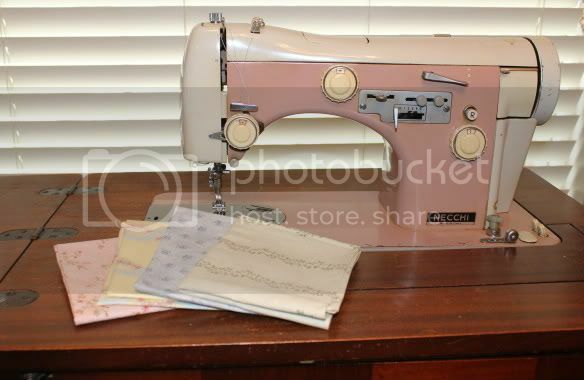 So, in honor of Grandma's generosity (she also gave me a box of fabric), her 80th birthday (today), and my 32nd birthday (yesterday), I'm giving away four fat quarters picked to match the Necchi. 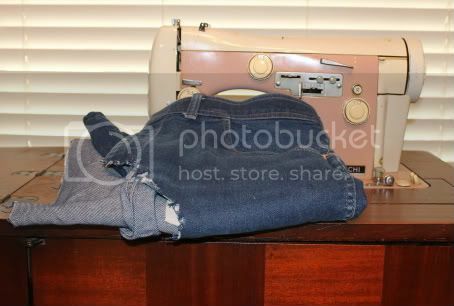 They're the jeans that were cut off her husband the day he went to the hospital. I never got to meet my husband's grandfather - he died just before we started dating. I'd like to do something special with his jeans - I just don't know what. So, for a chance to win, just comment with a suggestion of what to make with them. Mr. Random Generator will pick a winner next Saturday. You could make a quilt out of the pockets. I saw a really nice one at a lady's house using just the back pockets. Since you are in the USA and I know ya'll love your patriotic quilts, you could use the jeans for the blue and incorporate some red and white prints. Maybe even piece from the jeans some stars for the backing. Oh, I feel a pattern coming on. HA HAHA. To bad the Canada flag didn't have as many fun elements as yours! Thanks for the change to win and congrats on your new to you machine! Great little machine, although I did have to look up the company. I've seen really cute purses made with jeans and you have pocket and loops to be able to hold all those small items. Another option is to make a small lapquilt for your grandmother. When my mom was that age, she liked having a small quilt that covered her lap and legs up but wasn't so large that she had to worry about tripping when she got up from the chair. I made one from a flannel panel that was the right size for car trips. Having a flannel backing also helped keeping the quilt on her lap. You could put one of the pockets on the quilt for her to keep a hankie, any meds, the reading glasses, etc. Add old flannel shirts to the jean material and you could make a rag quilt. I made a rag quilt out of my brother's jeans after he died and then took all the pockets and zippered areas and made purses with embroider for my sister and his girl friend. LOVE the machine ! lucky !!! How about a tote bag or purse from the Jeans ??? And grats on the awesome machine!! I know I am too late for the giveaway...but I thought I would throw this in...My Sister In Law did an amazing quilt for a friend who's husband passed away. It was a combo of the jean pockets (as thier own "blocks"), shirts, and the jean material (beyond the pockets) was used as a sashing. It came out beautifully and is very well loved. Good luck and enjoy whatever you do with it!! iSpy Sliced Coins - Finished!